Crosshatch triggerfish larvae (Xanthichthys mento) were raised from captive-spawned eggs at 77-79F on cultured ciliates, wild copepods and artemia. The larval duration was 200 days. First record of Crosshatch triggerfish culture. The triggerfishes belong to the Balistidae family, which includes about 40 species in 11 genera. They inhabit subtropical and tropical seas worldwide. They usually live on reefs and feed on benthic invertebrates, small fish, and sometimes algae. Triggerfish species play an important ecological role in controlling sea urchins and other benthic invertebrate populations, and some species are valuable and delicious food fish (Queen Triggerfish, Grey Triggerfish). Like most triggerfish, Queen Triggerfish (left) and Grey Triggerfish (right) are nest builders. Spawn size for both species exceeds 100,000 eggs. The parents defend the nest vigorously until the embryos hatch in the evening, the day after spawning. Triggerfishes live singly, as pairs, in small groups, or in schools. They are demersal spawners and are typically highly territorial during courtship and spawning. Many species build nests and some scatter their eggs. 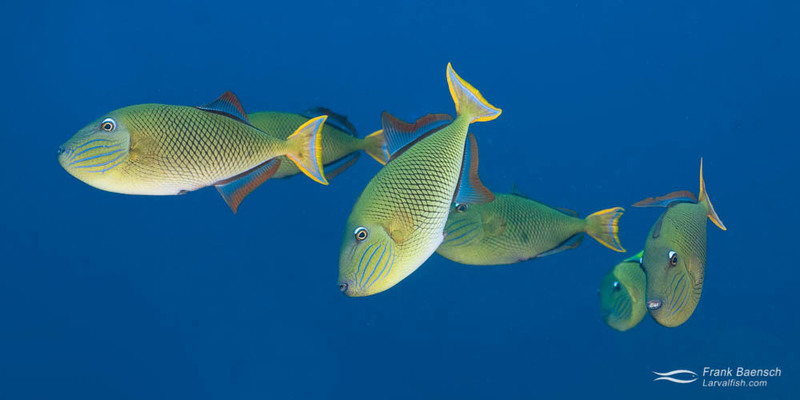 Most triggerfish aggressively defend their spawns. Spawning generally takes place in the early morning, with the spawn size ranging from thousands to millions of eggs. The demersal eggs are small (0.45 to 0.65 mm, depending on the species), spherical, adhesive, and contain multiple oil droplets. Embryos hatch in the evening. Left: Clown Triggerfish, a popular and expensive aquarium addition. Right: Niger Triggerfish juvenile. Aquarists prefer juveniles to the more aggressive and expensive adults. Most commercially farmed marine aquarium fish larvae, like clownfishes and dottybacks, are raised using rotifers beginning when they first start to feed. Reef fish families that produce smaller and more primitive larvae, such as angelfishes and snappers, require the size and nutritional qualities of copepod nauplii to survive through first feeding. Using local copepods to successfully rear Centropyge species for nearly a decade led me to believe that most reef fishes could be cultured using this live food. Right: Picasso Triggerfish larva, 3.1 mm TL, with full gut, 17 dph. The Picasso Triggerfish (Rhinecanthus aculeatus) builds nests approximately every three weeks, spawning up to a million eggs. Females aggressively defend the nest. The larvae are very similar to crosshatch triggerfish larvae in size and early development. I was mistaken. I discovered that several wrasse and triggerfish species require foods smaller than the copepod nauplii I used to grow Centropyge. The small mouth size, throat size, or limited hunting ability of these tiny larvae restricts them to live foods less than 60 microns in size at first feeding. Many larval species may actually fall into this category. Throughout the next year I searched for a new live food, isolating microscopic organisms (dinoflagellates, diatoms, and ciliates) from coastal waters around Oahu. Larval rearing trials were conducted using angelfish larvae as a control and wrasse and triggerfish larvae as the test animals. The breakthough organism was Strombidium sp. The ciliated protozoan oligotrichs were used for the first 10 days of the larval period to bridge the critical food size gap and allow the larvae to feed on copepod nauplii. I decided to breed the Crosshatch Triggerfish (Xanthichthys mento) because of its popularity in the aquarium trade, its high and dependable embryo production, and its primitive and challenging-to-raise larvae. Crosshatch Triggerfish (X. mento) prefer cooler water between 65 and 74F. In warmer waters of the main Hawaiian Islands they are rare and mostly found singly or in pairs at depths exceeding 200 feet. In cooler waters of the Revillagigedo Islands they are common in shallow waters and form groups of multiple males and females (pictured). Crosshatch Triggerfish prefer cooler water between 65 and 74F. In warmer waters of the main Hawaiian Islands they are rare and mostly found singly or in pairs at depths exceeding 200 feet. In cooler waters of the Revillagigedo Islands they are common in shallow waters and form groups of multiple males and females (pictured). The species spawns approximately every 19-23 days in captivity. It scatters up to a million eggs on the tank bottom substrate. The embryos are 0.48 mm in diameter and the first feeding larvae are 2.1 mm TL. The larval stage is very long, exceeding 100 days. The X. mento pair collected off Oahu, Hawaii, was brought into the hatchery. The pair reproduced approximately every 19–23 days and scattered up to a million eggs onto the tank bottom. Spawning took place in the morning and the eggs hatched the following evening. The eggs are small (0.48 mm in diameter), spherical, adhesive, and contain multiple oil droplets. Crosshatch Triggerfish (Xanthichthys mento) pair (male below female). Triggerfish larva, 3 mm TL, 17 days post-hatch (dph), 8.6 mm TL, 54 dph. Triggerfish postlarva, 43 mm TL, 101 dph. First feeding X. mento larvae are moderate bodied, just 2.1 mm TL, and have a very small mouth. Features of triggerfish larvae include the very small mouth at first feeding, the raised cluster of spinules on the preopercle, the curved barbs on the first dorsal spine, the pelvic filament, the ovoid to round body shape, and the extended pelagic juvenile stage. The larvae were raised on cultured ciliates (Strombidium sp.) followed by a combination of size-strained cultured and wild copepods. The larval phase of X. mento is about 200 days. The small mouth size during the early larval stages, aggression during the later larval stages, and the long pelagic larval and juvenile period makes this species unsuitable for aquaculture. This is the first documented rearing of a Xanthichthys species. The Crosshatch Triggerfish is the second triggerfish species raised in captivity. The first captive-bred triggerfish was the Queen Triggerfish (Balistoides vetula). This feat was accomplished in 2009 by a research team headed by Dr. Andrew Rhyne, a scientist at New England Aquarium (NEAq) and associate professor at Roger Williams University (RWU). Tom Bowling of Biota Marine in Palau has been commercially producing Clown Triggerfish (B. conspicillum)(the third cultured triggerfish species) since 2015. The larvae are raised in large, rectangular concrete tanks on rotifers and zooplankton. The B. conspicillum larval phase is about 40 days.